A couple boost the curb appeal and comfort of their Cape Cod-style property. A new family room was carved out of garage space; a gambrel roof and small porch spruce up the front. WHEN HOUSE HUNTING more than a decade ago, Brad Ashbrook took one look at the home he’d end up buying in Wellesley and kept driving. “The house had been on the market for a long time. It was such an ugly duckling,” he recalls. 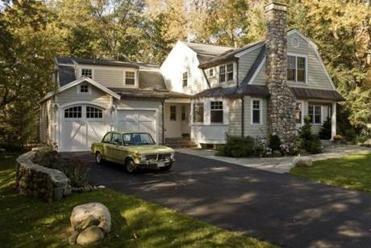 His wife, Maria, however, saw possibilities in the Cape Cod-style house, built in the 1950s. “It was on a great lot that bordered Boulder Brook Reservation,” she says. The couple contracted with Medfield-based architect David Sharff, who drafted plans to enlarge the home while keeping its cozy appeal. To expand existing rooms, he found new ways to use nonessential spaces. A breezeway was enclosed to expand the kitchen, which now gleams with custom cabinetry, coast-green granite counters, and a Wolf range. Sharff also converted a 12-by-12-foot screened porch at the back of the house into interior space to add more square footage to the dining room, and removed a wall to integrate the new dining space with the kitchen. A peninsula in the kitchen provides casual mealtime seating, while a second peninsula borders the new family room. Since the site abuts conservation land and hiking trails, the Ashbrooks couldn’t alter the home’s footprint at the back of the house, but they could expand slightly toward the front. “We brought the garage forward and took about 12 feet of the existing garage to make the family room,” says Sharff. Reconfiguring part of the garage as living space meant adding a steel ceiling beam for support. Sharff turned the structural necessity into an attractive design element by adding more beams to create a coffered ceiling. After living in their “ugly duckling” home for seven years, a Wellesley couple set their sights on boosting its comfort factor--and its curb appeal. Fans of cottage-style architecture, the Ashbrooks liked the idea of using built-ins with that aesthetic to define spaces and add character. In the family room, custom-made bookcases extend to the ceiling. The dining room now has wainscoted walls and two built-in china cabinets separated by a window seat. While the house has expanded to a generous 3,500 square feet — roughly 1,000 square feet was added during the renovation — its beautified facade remains relatively modest. Gone is the old white aluminum siding, replaced with shingles. New, subtle details have classic appeal. “Since it was a smaller house, we were able to add copper gutters, and the chimney was refaced with stone,” says Sharff, who embraced the home’s original asymmetrical nature, including using two different garage doors and various rooflines. A new front porch is defined by graceful columns. A shed dormer with gambrel roof was added over the living room, accommodating a new second-story bedroom and bathroom. More windows were added throughout the house, offering multiple views of the tranquil wooded setting.